Two rear additions make more room for the Hastings, their four boys, and yellow lab, Sawyer. The original façade remains unchanged out of respect for the home’s history. 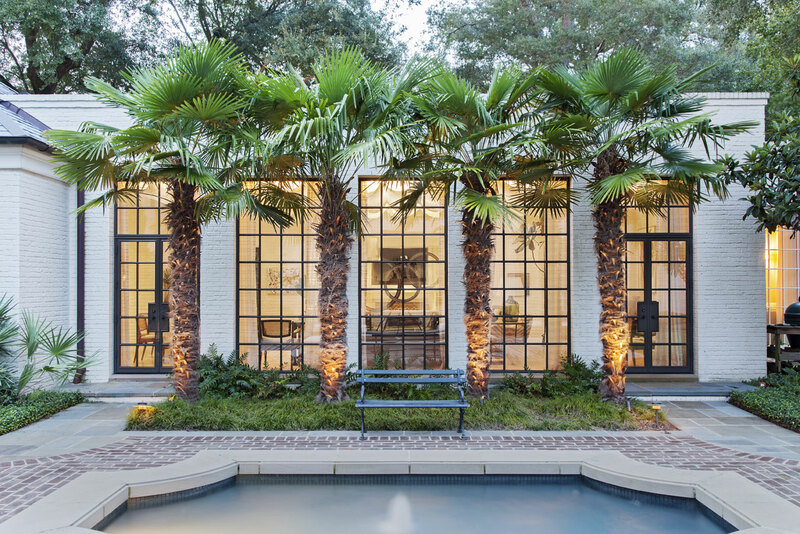 sun catcher: With its glass ceiling, brick walls, and concrete tile floors, the sun porch is architect Bobby McAlpine’s update on the sunken dens found in many mid-century homes. One of the goals of the renovation was adding plenty of windows to unify the outdoor and indoor spaces. 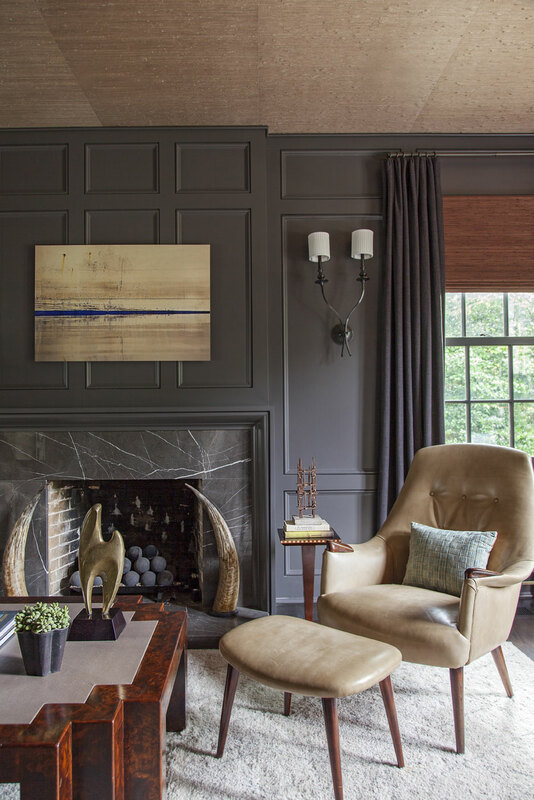 MODERN HISTORY: What was once Sarah-Hamlin’s grandparents’ formal parlor has been transformed into a handsome office/library for her husband, Matt. 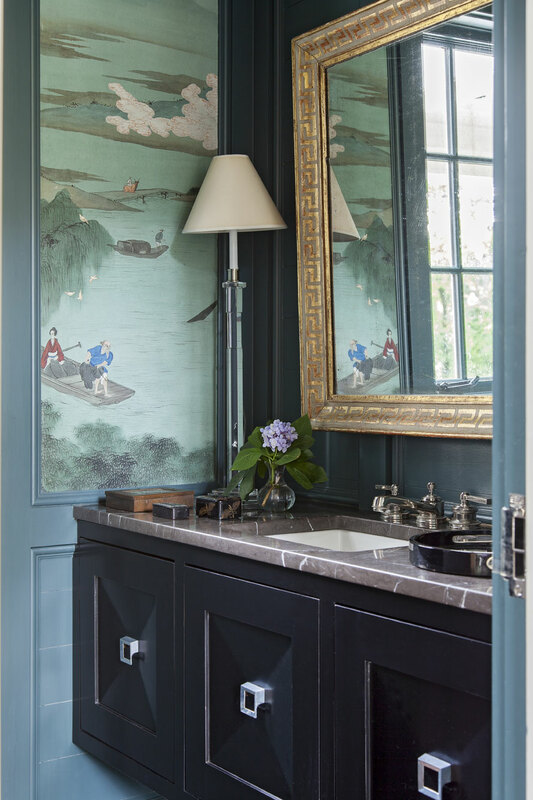 reinvented: Hand-painted panels that Sarah-Hamlin’s grandmother had commissioned during a trip to China find a new home in the first-floor powder room, where they look fresh against walls painted “Amazon Green” by Benjamin Moore. 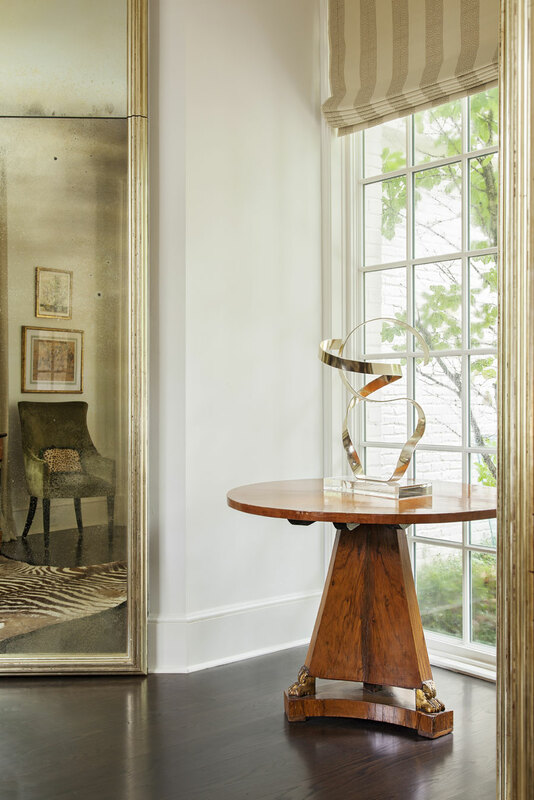 a Keen eye: Among the couple’s collection of artwork and antiques are the circa-1974 Ribbon Sculpture by Dan Murphy and Regency walnut center hall table purchased from Michael Bruno before he founded 1stdibs. The door to the bar is hidden by the full-length gilt-wood mirror, custom made by Bob Hines of R Squared Glass Artisans. 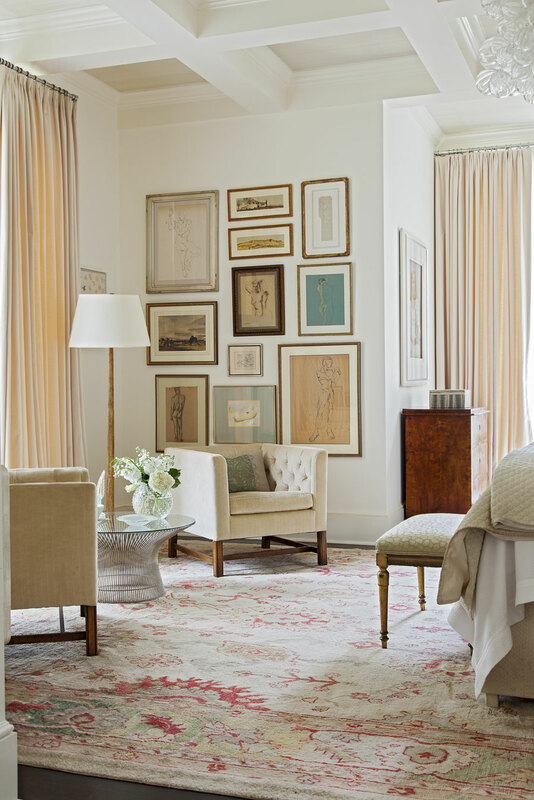 neutral territory: The graceful, first-floor master bedroom is both elegant and modern with ivory drapery and an array of artwork. COMFORT ZONE: On fall evenings, the whole gang gathers around the outdoor fireplace to catch up on the day’s events (above). 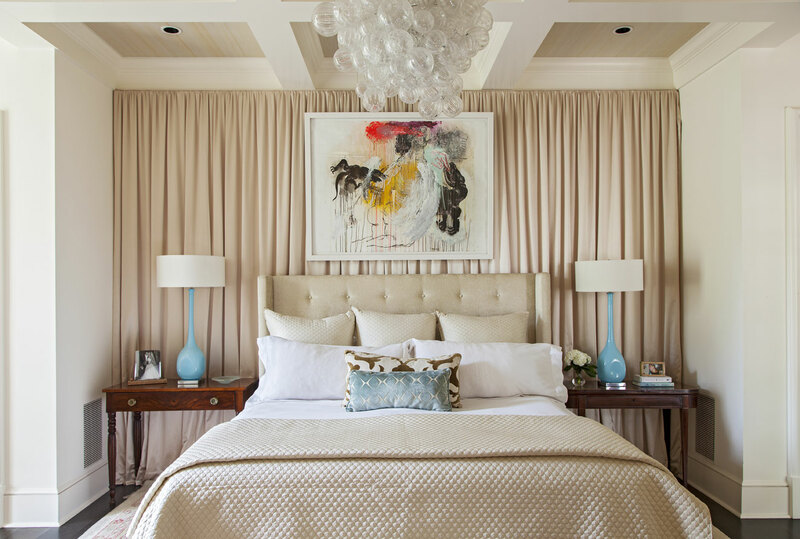 Above the bed, a sculptural chandelier hangs near a colorful abstract piece by local artist Tim Hussey. CABANA COOL: Elevated pool cabanas provide shade and a place to relax (top). A landscaped brick wall acts as a privacy screen as the Hastings boys face off in the pool for a game of chicken. It’s a sunny Saturday and, behind the grand façade of a seemingly traditional white brick colonial in West Ashley’s The Crescent neighborhood, the Hastings family is abuzz with activity. Twins Henry and Thomas, age nine, race through the airy, light-filled entry hall to the first-floor master suite. The room projects elegance—a sculptural chandelier presides overhead, while plush ivory drapes and a splashy painting by area artist Tim Hussey add a sense of glamour—but it’s kid-friendly, too: the covers are already mussed, and the boys hop on the bed and start a pillow fight. 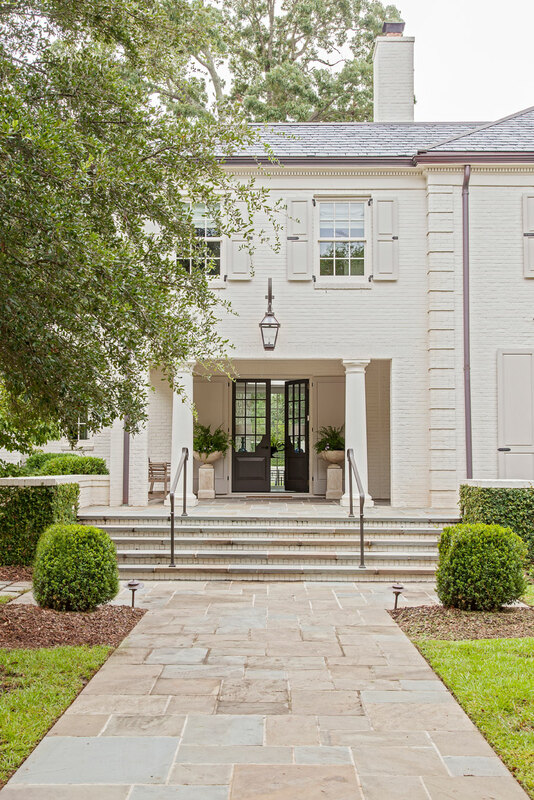 From their vantage point, floor-to-ceiling windows look out on a trim lawn bordered with boxwoods; in the center, a locally made Swurfer swing beckons from a tall water oak tree. 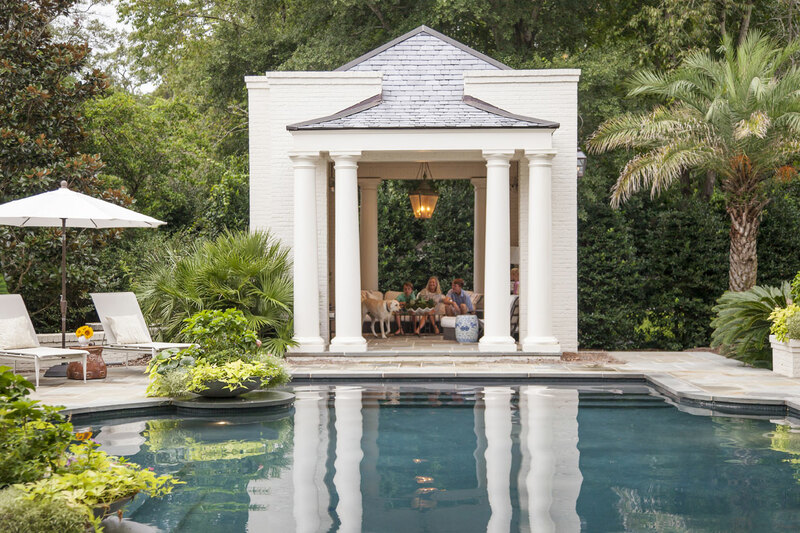 Just beyond the oak, in a swimming pool nestled between two column-festooned cabanas, older brothers Charlie, 12, and Jack, 14, captain rafts they crafted themselves from cardboard boxes. This action-packed scene is just what Sarah-Hamlin Hastings and her husband, Matt, hoped for when they relocated here from Connecticut in 2010. Tired of long commutes to New York City and lured by the promise of more time spent in the company of kin while soaking up the Lowcountry sun, the couple pointed their rudders south and steered their brood back to Sarah-Hamlin’s hometown. Plans to settle downtown were quickly scrapped when Sarah-Hamlin’s grandmother offered to sell them her circa-1952 home just over the Ashley River Bridge. The house needed considerable updating but presented a powerful emotional pull: “Matt and I got married here under a tent in the backyard, and as a child I came here nearly every weekend for Sunday dinners,” Sarah-Hamlin says. She dreamed of her sons supping alfresco where she once savored her grandmother’s signature dishes (“she made the best creamed spinach and Charlotte russe”) and playing on the same lawn that’s long hosted her extended family’s annual Thanksgiving football game. 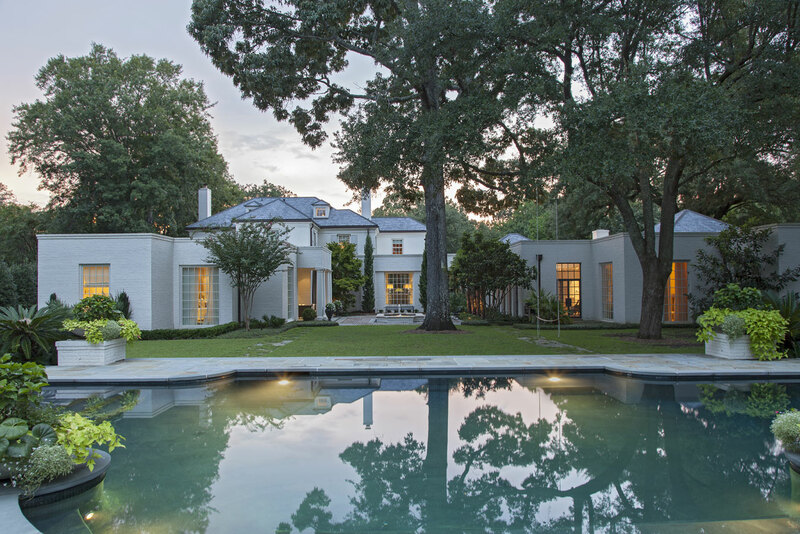 She was also sold on the circa-1926 development—designed by the Olmsted Brothers firm, sons of Frederick Law Olmsted of New York City’s Central Park fame—that boasts landscaped walking paths, scenic lakes, and streets canopied by mature oaks and magnolias. And so Sarah-Hamlin, an interior designer who is debuting her Fritz Porter Design Collective—a combo art gallery, design showroom, and antique shop in the recently refurbished Cigar Factory—this month, dove in and began mapping out the renovation. 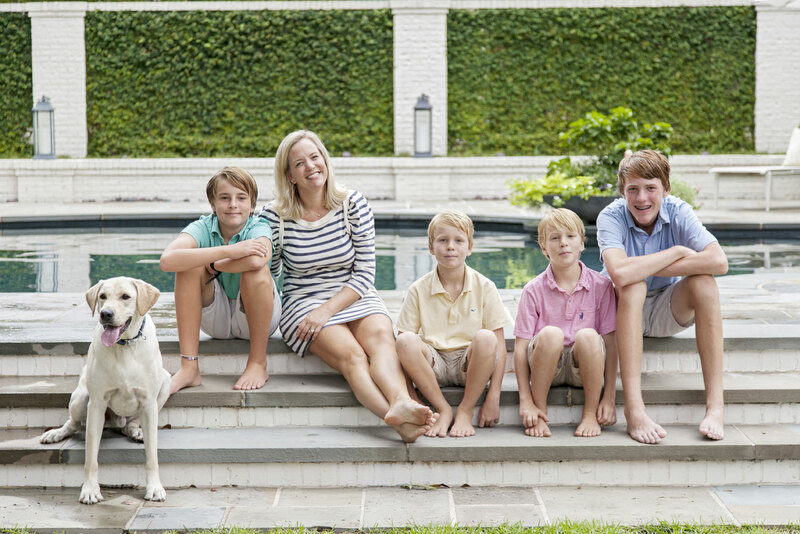 For her active family of six, plus their yellow lab, Sawyer, Sarah-Hamlin knew she needed a more open layout with plenty of flow. “Before, it was like a maze, with a warren of little rooms,” she says. And while existing details such as dentil mouldings and paneling hand-painted with an Asian motif had vintage charm, she craved a more streamlined aesthetic. “I wanted to keep the spirit of the traditional colonial but bring it into the 21st century,” she explains. Perhaps most importantly, she aimed to reboot the underutilized backyard and transform it into a headquarters for family fun. After all, she moved here to relax and enjoy the scenery, which meant taking full advantage of the property’s acre-and-a-half double lot. McAlpine kicked things off with a new U-shaped floor plan featuring a spacious entry hall connecting two symmetrical wings with mirror rear additions. To free up space within the original footprint, he cut rooms that were superfluous to modern life from the layout. For example, Sarah-Hamlin’s grandmother once entertained in a formal sitting room decked out with chintz curtains, oil paintings, and an oriental rug, but in its new configuration, the house doesn’t have a parlor. “Nobody uses those formal spaces anymore,” Sarah-Hamlin points out. Instead, she steers impromptu guests to a lounge area within the entry hall. With the new floor plan in place, they curated an edited palette of timeless materials and colors. “Almost everything is white, pale grey, or a dark grey called ‘Black Fox’ from Sherwin Williams,” Sarah-Hamlin says. 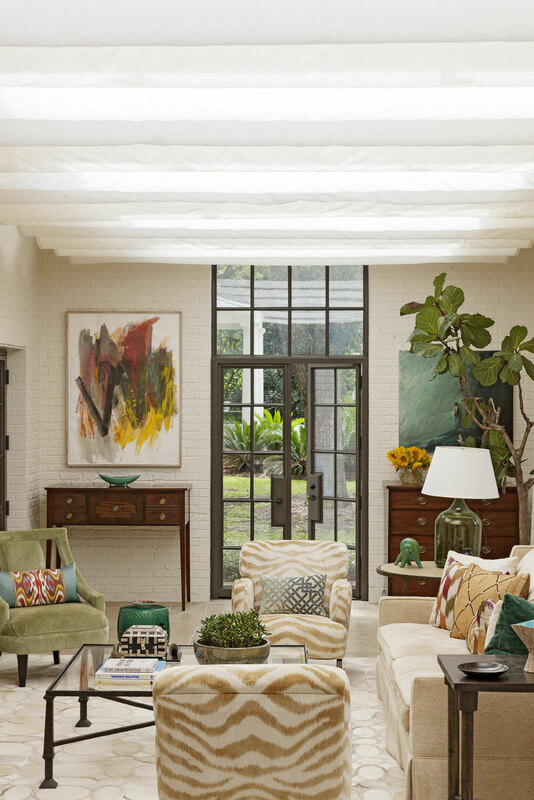 Atop this neutral base, she freely layered in statement-making light fixtures, such as the Lindsey Adelman number in the kitchen; punchy textiles; and lots of modern art to keep things feeling fresh. Still, there are nods to the mid-century era, and to her grandmother’s legacy. For family hang time, the gang gravitates to the glass-ceilinged sun porch. With its white-washed brick walls, stone floors, and recessed footprint, “it’s Bobby’s interpretation of a sunken den, which was a ubiquitous architectural element of homes in the ’50s and ’60s,” Sarah-Hamlin says. And while the aforementioned hand-painted paneling felt dated and heavy lining the walls of the dining room, she knew it was special to her grandmother, who had it commissioned while on a trip to China—so a few of the panels found a new home in the first-floor powder room, where they really pop against walls painted a deep shade of grey-green. Sarah-Hamlin’s inspiration through the whole project was light, which meant “adding as many windows and skylights as possible to create a seamless flow to the outside,” she says. Their placement informed Mike Kaiser’s landscape design: “For each window, we tried to have something beautiful to look at, whether it was an object or just a well-proportioned space,” Kaiser explains. For example, the entry hall, sun room, and master all overlook the courtyard that occupies the center of the U-shaped abode, where a graceful fountain provides sound and movement. “It’s my hope that they fling the doors and windows open and hear that water bouncing off the walls,” he notes.